Should you just replace the screen fabric or the whole thing? 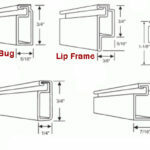 There are benefits to both rescreening existing frames and to replacing them entirely for both sun shades and bug fabric, and the answer is based on several factors. How is it going to look if you just replace the fabric? For one, any time you are considering these two options, the aesthetics is going to come first for most people. Often times in Arizona, because of the harsh effects of the sun we see the frames of the window screens just as worn and faded as the mesh itself. If not due to sun exposure, after 10+ years of being removed and re-attached by window washers or whomever, the frames tend to get scratched, dented, or in some cases bent beyond repair. In any of these cases, it may be best to go with a replacement. Does it cost much more to replace the entire screen? The simple answer is often yes it does. However, it may surprise you how little more the cost may be. The fabric itself makes up for approximately 75% of the actual material cost when going with new sun screens, and closer to 90% with bug screen replacements. So, when factoring in the extra time involved in protecting, loading, and hauling the old frames back to the shop to perform the work, we typically only see a 5-10% savings for using old sunscreen frames, and essentially no savings for bugscreens. So when does it make sense to use your old frames? In our experience, given all the cost differences, and the final product our clients have more often than not decided to go with new screens. This being said, the times we have seen it worthy of just new fabric have been in cases where the frames are still in good shape throughout the home, and there are more than just a few screens. At the end of the day, our products are designed to save you money, and if rescreening your old solar screen frames will save you enough money to pay for next month’s utility bill, than it may be the right choice! 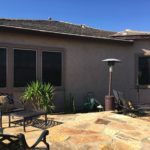 To find out more about our products and services, or to discuss whether you should replace or rescreen your window screens, feel free to contact Screens Unlimited today by calling 623-399-4942.